Here's a great new online slots game from Iron Dog Studio which you can try. Iron Dog Studio is based in Hove, England. It is a fairly new company with less than 10 games under its belt. This doesn’t mean that you will find anything lacking in their games. Instead, the developers tend to sharpen their graphics and strive to make a quality game that will cater to every kind of gambler. Other games they have in their collection include Cherry Blast, Treasure of Horus, Neon Jungle, etc. The minimalistic design entails striking pinkish- purple colours over a black background with images of galactic clouds appearing in the distance. Thanks to the game’s low volatility game play, players can find a winning spin for every stake placed. If you miss a win on any of the fifty permanent pay lines, a bonus re-spin activates until you get a successful winning formation. The kick is that the game gives you several chances, but the potential winnings are dismal in comparison to other online slot machines. The slot’s lowest valued icons are A, K, Q, J, and 10. 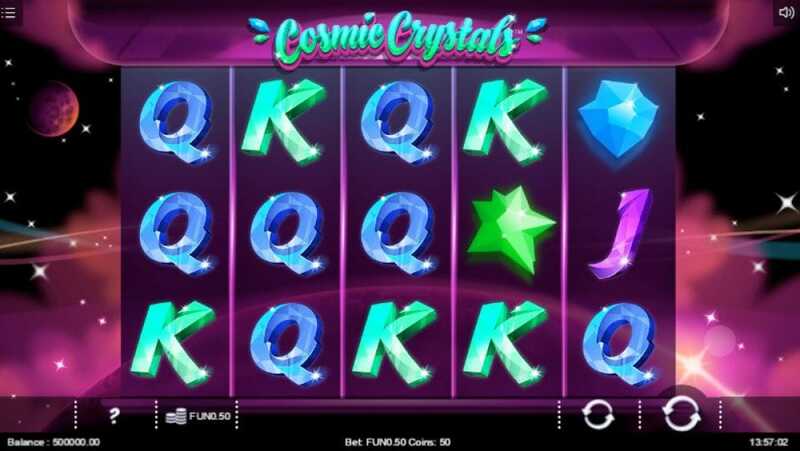 These pay out small earnings with bet multipliers ranging from 2x to 75x when 3 to 5 matching crystals align. A player has to place a max of 50 pay lines per spin. This means the only way you’re ever going to break even is if you find 5 matching A or K icons so that you can strike bet multipliers 60x or 75x. However, not all hope is lost. 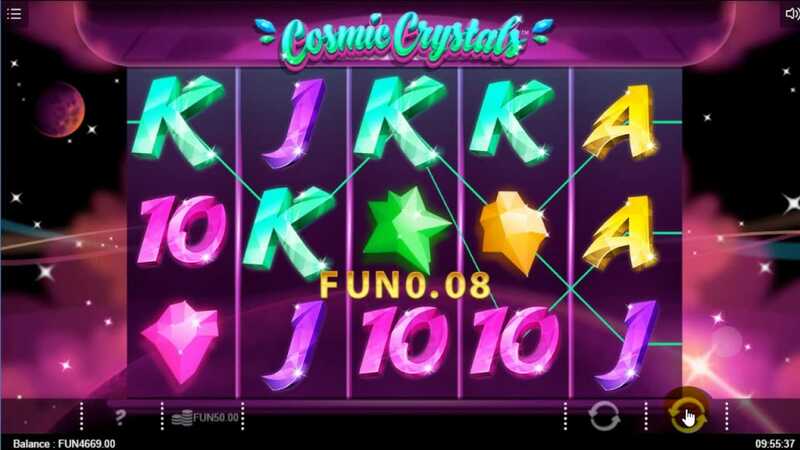 You can take advantage of profitable symbol combinations by matching 5 different crystal symbols that create a unique prize- five-in-a-row wins ranging from 100x to 1000x. Not all the players are usually lucky enough to score this big one, but when they do, it helps boost their betting balance significantly after going through a season of low value prizes. Another thing to love about the game is that every player has the assurance that they will eventually boost their balance since several pay lines can be activated at once – with 50 of them, you’ll never miss your chance to shine! You can start your bet anywhere from 0.20 credits to 50.00 credits. This advantage provides a lot of betting room for both low and high rollers. Wild symbol- The wild symbol in Cosmic Crystals is represented by a red-yellow gem symbol. It appears over the reels unexpectedly acting as a substitute for other icons to create winning combinations. When it appears it expands vertically and covers all 3 reel positions. This increases chances of multiple pay lines opening which leads to a larger prize payout. It gets better. Any wild symbol that shows up on your non-winning spin remains there all through. Free re-spin feature- There are no free spins in this game which is okay given you have a unique re-spin feature. Every time you miss out on a winning combination, the game gives you a re-spin. Players will keep getting these ‘free spins’ until they start winning. This feature ensures you don’t lose on your wager. What makes this game unique is that players have the guarantee that they will not leave the machine without winning at least part of their money back. This is a relief for gamblers who get impatient or despaired easily. Are you ready to explore the cosmos with Cosmic Crystals? You can tap and swipe through this space action anywhere you are since this Vegas online slot game is available on all your devices. Try it today and see if the stars match your luck.